Howdy and welcome to another Menu Plan Monday. This weekend we went to the Louise Mandrel/Lee Greenwood concert and it was really good - surprisingly good in fact. They had a great band and Mr. Greenwood still sounds exactly the same as he has for 30 years or more. For me, one of the signs of an entertainer with longevity is to be able to select songs that suit their voice (you'd be amazed at how many singers don't do this) and he did that so well. One of the other signs is that the performer can also do some other stuff - like play saxophone and keyboards for instance - instead of just belt out tune after tune. I buy cd's for tunes I buy concert tickets to be entertained. This week coming up Diva has the day off for Presidents' Day (yea! ), we are having the Pastor & his wife over for dinner, and the rest of the week is back to normal. 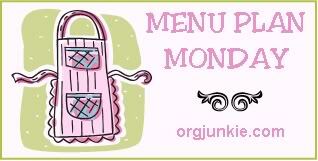 Have a wonderful week and hop on over to Organizing Junkie's Menu Plan Monday for more menu inspiration.